I bought this book on a whim. the cover is neat. The synopsis sounded exciting. It was on sale for only a few dollars (it was part of my massive Book Outlet haul). I don’t read a lot of science fiction, but I figured it sounded neat so I’d try it. I’m very, very glad I picked it up. 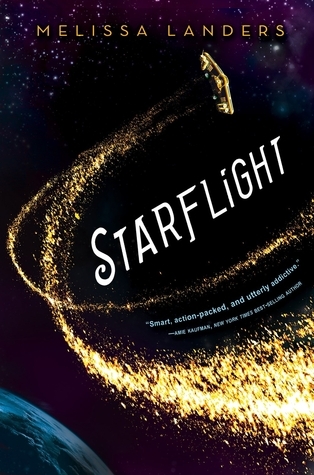 Starflight is Firefly in YA novel form. For those of you unfamiliar with Joss Whedon’s fabulous cult-classic T.V. show starring Nathan Fillion and an amazing crew — Firefly is a small cargo ship manned by a ragtag crew. They are good people who do some not so good things to survive. The show is basically a western in space. With space pirates. And lots of snark. And fun. I think I loved Starflight as much as I did, because I really liked Firefly. While neither of these exploits into space are perfect, they are a lot of fun. Solara is a fierce character trying to find a way to survive and is willing to do whatever she needs to. She is snarky and smart, and still trying to figure out who she is and what she wants. Doran at first seems like a total prick, but he grows on you. He’s a lot smarter, kinder, and braver than he first seems. The whole crew of the Banshee are interesting, strange, and full of secrets. And when they get stuck with no way out, they make a way. And while doing it, the form a little family. Starflight is hilarious, full of snark, conspiracy, cool space ships and space pirates! Also, did I mention the space pirates?